64 | TH E M R EP O RT FINAL THOUGHTS Final Thoughts Affordable housing, the rising costs of lending, and the CFPB were at the forefront of the industry this month, and professionals from all walks of life had plenty to say about each of them. "[As] Kanye West, recently reminded us, The only true freedom is economic freedom." JEB HENSARLING (R-TX), chairman of the Financial Services Committee, on the importance of the group's first legislative mark-up last month and its role in achieving economic freedom for Americans. "An administrative error" Last month Bank of America filed court documents revealing that the company mistakenly marked an $18 million mortgage as paid off in 2011—leading to one New York homeowner flying under the radar for years. "Obama is setting us up for another housing crash." New York Post writer PAUL SPERRY on loosening credit standards, decreasing FICO scores, and other red flags in the housing industry. "When you have a pot of money, people are going to be tempted to use it." SVP and Senior Counsel for the American Bankers Association JOSEPH PIGG on Fannie Mae and Freddie Mac's questionable use of guarantee fees. 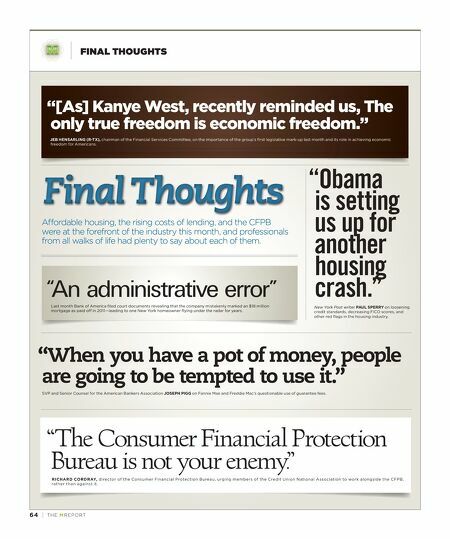 "The Consumer Financial Protection Bureau is not your enemy." RICHARD CORDRAY, director of the Consumer Financial Protection Bureau, urging members of the Credit Union National Association to work alongside the CFPB, rather than against it.